Photograph courtesy of Allen Zumach. (A reading from Genesis 11.1-9) Now the whole earth had one language and the same words. And as they migrated from the east, they came upon a plain in the land of Shinar and settled there. And they said to one another, ‘Come, let us make bricks, and burn them thoroughly.’ And they had brick for stone, and bitumen for mortar. Then they said, ‘Come, let us build ourselves a city, and a tower with its top in the heavens, and let us make a name for ourselves; otherwise we shall be scattered abroad upon the face of the whole earth.’ The Lord came down to see the city and the tower, which mortals had built. And the Lord said, ‘Look, they are one people, and they have all one language; and this is only the beginning of what they will do; nothing that they propose to do will now be impossible for them. Come, let us go down, and confuse their language there, so that they will not understand one another’s speech.’ So the Lord scattered them abroad from there over the face of all the earth, and they left off building the city. Therefore it was called Babel, because there the Lord confused the language of all the earth; and from there the Lord scattered them abroad over the face of all the earth. My topic title as assigned is “Rest from Technology.” If I were to choose my own title, the alternative would be: “Why My Coffee Becomes Cold before I Finish Drinking It in the Morning.” I will get to that later, but the point will be the same. I chose the Genesis reading as I was searching around for the right approach to the triple–header connection of Sabbath, rest, and technology. The Babel story popped up by serendipity when I was looking for something else. In standard Minnesota Norwegian Lutheran tradition, I encountered this story, pondered some moments, then decided: it was meant to be. The story hones in on technology in its first words: “the whole earth had one language.” We soon get to brick and mortar technology and the building technology of a city and a tower. However, primarily this is a story about confusion. Are you ever confused? I know I am and I suspect others are confused as well. Here we are some thousands of years after Babel’s tower, and people still think they can, by their own means, reach into the high heavens or some reasonable facsimile thereof. We may think of technology as “high tech,” wherever that expression came from. Is technology high as the heavens are high? Technology is as old as human control of fire. About 2 million years ago when humankind began walking around and taking off for the four corners of this rounded earth, we began our technology with control of fire. By comparison, the technology of language is new – 50 thousand to a 100 thousand years ago, and story-telling only 15,000 years old. We have speeded up technology ever since those prehistoric days. What do we mean by technology? Essentially, technology is any invention or improvement that people have made beyond nature or our natural state; we might say beyond our naked existence. We invent and evolve our technologies for various purposes – presumably all for human benefit or well-being in our body, mind, and soul and in relationships with one another. In short, for our mutual survival. By technology we expect greater efficiency and amplification of results. These gains presumably arrive with less effort, less time, less cost, less waste, and less feuding over resources. We are in search of better health, longer life, enlarged comfort and security, more leisure and fulfillment, and such other good things. For all this, we thank you dear technology. Technology gets complicated, we might say confused, even as Babel became. Not all technology advances together. Technologies that come full of promise, do not always deliver as expected. When some technology becomes a problem, we think more technology will fix it. Guns a problem? Obviously, we need more ammo. The subject is vast and for this reflection, we must focus. As recently as yesterday, the StarTribune carried an article on smartphones exploring “whether the white-knuckled grip that people have on their phones is actually the phones grip on them.” A Stanford University psychiatrist raises concern that the constant bombardment of messages develops an e-personality, an inability to participate fully and, indeed, socially, with what is going on in their presence. The newspaper describes a 14-point digital diet that at least distances the self from the phone and potentially weakens the habit. Sherry Turkle, a psychologist and professor at M.I.T., has been exploring our relationship with machines over the last twenty years. Her 2012 book is Alone Together: why we expect more from technology and less from each other. Turkle notes that where she spends summers on Cape Cod, not too long ago people walked the dunes with their heads up, taking in the Cape’s unique environment. Now they often walk with their heads down, typing. She asks: how is 1t that we are connected as never before, yet are fleeing from conversation. Another side of the issue is whether or not our digital connections save us time. In the 1990’s, educators in league with commercial promoters of technology launched a campaign over the “digital divide” concerning access to technology as an equality issue. The poor, it was observed, had less access. Terms like digital divide bother me, because they come to us without full definition or detail. I wondered where all these people had been over the long-standing literacy and library divides that are as old as Sumerian cuneiform writing. Now studies show that teenagers in poor families spend 90 minutes more attending to digital media than their counterparts in higher socioeconomic families; in 1999 the difference was 16 minutes. Although, literature on the Sabbath exists in multitude, a 2011 book self-published by Bryan Brooks, is Creating a Tech Sabbath Habit in which he outlines his past addiction to being online and the remedy – a tech free day. Accordingly, he promotes his book in a blog by the same name, but does not post on Saturdays. As of this morning he has had one response, 62 likes, and numerous Twitter exchanges. By contrast in 2012, Google totaled 1.2 trillion searches in 146 languages; here are the top 4 search terms in the United States – 4, Hunger Games; 3, Election 2012; 2, Hurricane Sandy; and number 1, Whitney Huston. As far as my own experience goes, I am on my fourth computer since I started with one at work in the Fall of 1978. Most days since quitting employment, I spend 6 to 8 hours on my computer. Mostly, I use it for writing and pre-writing, but also communication, and (of course) tax preparation. I do not play games unless you count poetry and genealogy as games. Here the cold coffee comes in. I am an early riser and after I know I am mobile, I customarily turn on the computer, then do a few chores, and have “first breakfast” – a cup of coffee and some treat that Pat has baked. When I take my coffee to the computer and start working on something, I find that I soon forget about the coffee, and surprise, surprise – at the next sip the coffee is cold. Cold coffee has indicted me for my computer addiction, and I realize I have to do something about it. Changing has been a hard thing to do, but my best answer has been to cease and desist from the computer. Multi-tasking is a myth, I am convinced. It definitely helps to go to another place: I prefer the sunroom or the patio in good weather and keep a lookout on the natural world around us until the coffee is gone and it is computer time once again. Pastor Carol referred on Sunday to an article by David Brooks on the surge in Orthodox Jews living in New York. Because the Orthodox commit to a covenant with God, they differ from the general population in how life should work. How should life work? That is the main question for all of us as we consider the intersection of Sabbath, rest, and technology. We may not have the same Sabbath bulwark against the totality of work and technology that Orthodox Jews have had for millennia. But we do have the ability to assess ourselves apart from the equipment of our lives. And the more we exercise such assessment, the better we become at deciding for ourselves how our lives should work. © Copyright 2013 by Roger Sween. The selection of Genesis 11.1-9 is from the Bible, new revised standard version © 1989. I welcome comments on this blog. Direct personal comment to me at my email address. Slightly revised, 12 January 2016. 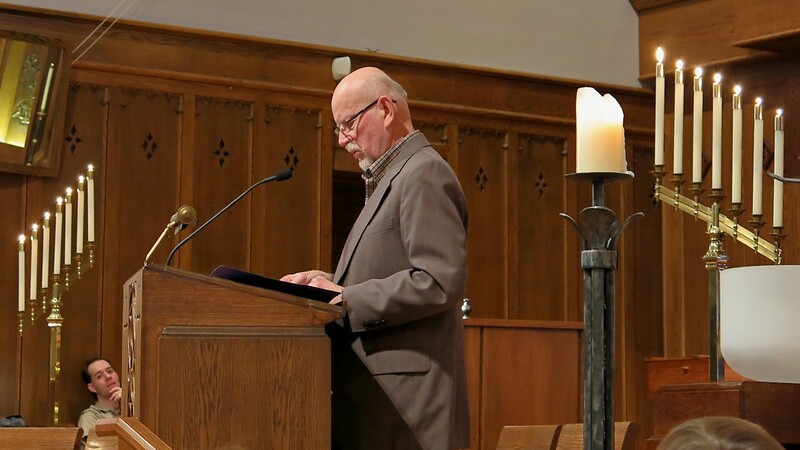 During the 2013 Lenten season, Pilgrim Lutheran held a series of Wednesday evening services following the liturgy of Holden Evening Prayer. In addition, one member of the congregation spoke each week on a topic related to the theme of Sabbath rest. The request made of me resulted in 5 weeks of mulling the topic, a little search of significant literature, a lot of puzzlement on how to address the intersection of Sabbath, rest, and technology, and five drafts in the last two weeks. The day before speaking, I reached a level of satisfaction of what I could profitably say in 12 minutes. That delivery went well thanks to a number of people who supported me in the process including Pastor Carol Tomer, Pilgrim staff member Peter Spuit, Pat Sween and other members of our family, my friend from childhood – Rev. Robert E. Hanson (ko shin) – and the members of our Sabbath discussion group. In addition to selection of the reading, I chose the hymn that followed the reflection – the four stanzas of “How Clear is Our Vocation, Lord,” Evangelical Lutheran Worship (2006) #580. You are currently browsing the RDS at Large blog archives for March, 2013.